Garage Door Repair Azusa Screw drive openers use a threaded steel rod, rather than a chain or a rubber belt. We are here to help you any hour of the day. These openers tend to work best in locations where the weather and temperature is constant throughout the year. They also are the slowest moving and noisiest of all three openers, but are the least expensive. Because of that we find most of these garage door openers failing today. Garage door openers have changed rapidly to include features that make your life easier and more secure. If you cant open your business in the morning, or cant lock it and feel safe at night when you leave your business at night, You should call Ken Davidson Garage Doors. We provide a 24/7 emergency service for rolling gates repair in Azusa. To avoid the unpleasant experience of facing a broken gate, we highly recommend to perform a gate maintenance every 6 months. The weather in Azusa is not gates friendly, and a simple maintenance job can save you a lot of time and money in the future. We specialize in all kinds of gates installation in Azusa. From commercial roll up gates, to a residential sliding gates, we will always be there to help. There are endless gates models and designs. Some need to provide security, and keep the uninvited outside, and some add decoration to the entrance where they are located. Some gates need to be massive and strong, and some need to be light, and need to blend into the area. Gates can serve multiple purposes, that is the reason why when it comes to gates we always try to find the right balance between beauty and security. We can offer endless different colors and designs, so each one can find the best gate for their home or their business. The right gate can varies between one place and an other. and it depend on few parameters. We, at Ken Davidson Garage Doors, will be happy to share our knowledge, and help you choose your new gate. After years of experience in the gates repair and installation field, we can help you find the right gate for your house or for your business. So contact us and get a free phone consultation for every gate question. Rolling gates can come and many styles, colors and design, but they all have one thing in common: They need to be strong, and keep the uninvited outside. If your rolling gate broke, and you are looking for a company in Azusa that fix rolling gates, look no farther. We specialize in all kinds of gates repair and installation in Azusa. No matter if it is a rolling gate, a roll up door, or a security gate, we are here to help. You should know that a broken gate, that cant be open or closed, does not mean that it is time to replace the gate. It only mean that it is time to call a gate expert, since professional gate technician can fix almost every gate problem. Ken Davidson Garage Doors specialize in all kinds of gates repair in Azusa, including rolling gates and store front gates. We know that a broken rolling gate, that need a repair, can be very unpleasant experience, and can lead to a lost of money and time. Just think about yourself trying to open the gate in the morning, or trying to close it by the end of the day, but the gate just refuse to move. That is the reason why we offer a 24-7 gates repair service in Azusa and We will always be there to help you put the gate back on track again. Warning!!! If your gate is broken/stack/making weird noises, we highly recommend to stop using it, and call a rolling gates company in Azusa, Since a broken rolling gate can be dangerous to you, or to the people who come near the gate. It is no secret, that a good and secure business can save a lot of money, time and frustration. That is why a good, smoothly working rolling gate is so important. And we like to think that a good gate start from good materials. And a professional installation job. But since the weather in Azusa is not friendly to the rolling gates and their parts, and since not every owner is providing the rolling gate with a maintenance service at least every six months, the gate can stop working. This is time to call Ken Davidson garage doors and gates, who have successfully performed hundreds of rolling gate repair projects in Azusa. To avoid the unpleasant experience of facing a broken gate, we highly recommend to perform a rolling gate maintenance every 6 months. The rolling gate maintenance is not a complicated job, and can be done by any gate technician. Do not wait until the gate will stop working completely, because then you will regret that you did not performed the maintenance on time. When it comes to gates or rolling gates installation in Azusa, you got to the right place. We know that you want a strong and reliable rolling gate, that will work perfectly 365 days a year, and that will be strong enough to keep the unwelcome outside. Ken Davidson garage doors and gates, specialize in all kinds of rolling gate installation in Azusa. From commercial rolling gates, to a residential sliding gates, we will always be there to help. A good rolling gate installation, can affect the way the rolling is going to work for years, that is why we always use the best rolling gates parts for the installation, and always the best technicians, who have experience in the rolling gate field, and who performed hundreds of successful rolling gates installation in Azusa. There are endless rolling gates models and designs. Some need to provide security, and keep the uninvited outside, and some add decoration to the entrance of the store. Some gates need to be massive and strong, and some need to be light, and need to blend into the area. Since gates can serve multiple purposes, we always try to find the right balance between beauty and security so you can have a strong and reliable rolling gate, that blend into the area..
During many years of experience in the rolling gates repair and installation field, we can help you find the right gate for your house or for your business. All you need to do is to contact us, and let us help you to choose the right rolling gate for you. Broken garage door spring, is one of the problems, that can lead to a broken or stuck garage door. No matter if it is a torsion spring, or extension springs, a garage door with a broken or damaged spring, should not be used, and should be repaired by a professional garage door technician, that know to match the right spring for the right garage door. There are many reasons, that can lead to a garage door with a broken spring: From using the wrong spring, to poor, or no maintenance at all, no matter what the reason is, we can fix it. We repair, replace and install garage doors springs in Azusa, and we will be glad to add you to our list of satisfied customer, that enjoyed the service of Ken Davidson Garage Doors. As mentioned above, a garage door with a broken spring (or any other problem) should not be used. But there is one thing you can do, to try and minimize the damage that a broken spring, which is under a lot of tension can cause, and that is to install safety cables. The only purpose of the safety cables, is to try and reduce the damage, if the spring will break one day, since when the garage door spring is breaking, it can be dangerous, and the safety cables will try and prevent a big damage. From torsion springs, to extension springs, when it come to garage door repair in Azusa, Ken Davidson Garage Doors can fix it. Like every other garage door, automated garage door can also be dangerous, if it is not correctly installed and being used. If your garage door opener stopped working, or is not working like it used to, you should not continue to try to use it, and contact a garage door opener repairman, to come and check your garage door opener. They key to a good and reliable automated garage door is to make sure that the garage door opener that is about to be installed is from a leading garage door openers brand, and that the installer is professional, and that he know which one is the right opener for your garage door. Ken Davidson Garage Doors can provide you those 2 things, since we only use a high quality garage door openers, and since each one of our technicians is a pro in the garage door repair service field, and have successfully installed and repaired hundreds automated garage doors. 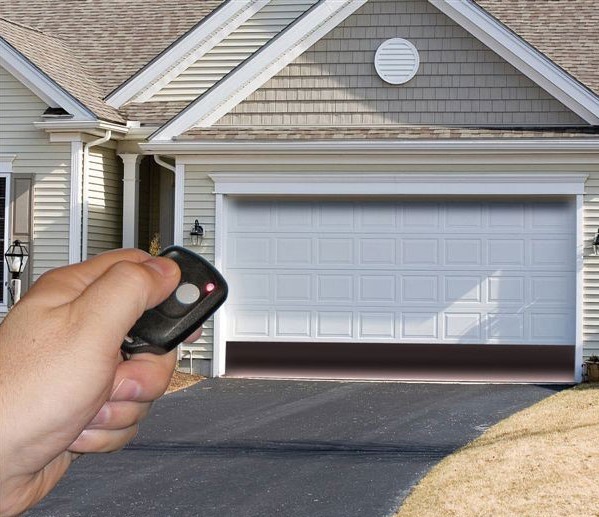 Please know, that every garage door opener, should include a safety feature, like safety sensors for example, that is going to prevent people, cars or any other object that crossing the path of the garage door when it is being closed from being hurt. Once someone or something will cross the laser beam that run between the sensors, the door will go back, and by that preventing the object in its path from being hurt. People tend to neglect, or to ignore the need for a garage door maintenance or garage door tune up. Most of them think: why should we touch the garage door if it is working? Well, they are wrong. Every garage door need maintenance, preferably twice a year. Although the door is working, even without the maintenance, a lack of maintenance will eventually lead to a broken, or stack garage door, that not only that it need maintenance, now it also need to be repaired, something that will cost you much more money, than of you would of use the maintenance services of a garage door company in Azusa. A garage door maintenance is not a complicated job, and usually can be done by any garage door contractor. A good garage door maintenance, should include adjustment to the spring, to the opener and lubrication. Beside the lubrication, that should preserve the parts, and that should help the door work smoother, a garage door maintenance is a good chance to inspect the parts of the door, and locate broken or lose parts that need to be repaired. To read more about garage door maintenance, click here. Please, if you choose to do the maintenance yourself, make sure you know exactly what you are doing. As we mentioned, a garage door can be dangerous, and should be repaired and maintained by a professional garage door tech. If you are looking for a garage door repair company in Azusa, you got to the right place! We provide all kinds of garage doors repair services in Azusa. Whether it is a residential garage doors repair service, or a commercial garage door repair, we can fix it. One of the most important facts, that every garage door repair man should know, is that every time that he go to fix a garage door, he must figure 2 important things: The garage door problem that need to be fixed, and the cause for the problem. No garage door repair service will be perfect, unless the garage door technician will solve the cause to the problem, that made the garage door need to be fixed. That is the reason why each one of our garage doors technicians have years of experience in the garage doors repair field. And we always know, that no matter what the problem is, we can fix it, and we will do our best to prevent it from happening again. So if you are located in Azusa, and you are looking for a reliable garage doors company, contact us, and we will do our best to provide you with the fastest and professional garage door repair service, that made us so famous. We, at Ken Davidson garage doors, believe that every professional garage door installation job start form 2 basic things: A high quality garage door and parts, and a professional installation job. Our goal is always to do our best to provide you a high quality garage door, and the best installation job. From residential garage door installation in Azusa, to a commercial garage door installation in Astoria, we got it all. Our reputation, as a professional and reliable garage door company, is being built from hundreds of satisfied customers, who knows that when it comes to garage door service in Azusa, Ken Davidson Garage Doors is the right choice. We know that a good garage door installation job, will lead to a garage door that will work perfectly for years (with the right maintenance job), that is the reason why we only use the best garage doors parts in the market, designed for the American standard. If you are looking for a garage door installation in Azusa, contact us, and we will help you to find the right garage door for you. We offer free phone consultation for all garage doors installation, residential or commercial, and we are always happy to assist you to choose the right garage door for you.